It is with deep sadness that the family of the late Eleanor Rideout announces her passing. 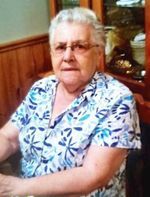 Eleanor passed away from the Northside Guest Home, North Sydney, NS on Tuesday, March 19th, 2019 at the age of 92 years. Predeceased by her husband – Woodrow Rideout; son – Bruce Osbourne; sisters – Ethel Gillingham (Edmund) and Maud Abbott (Richard) and brother Chesley Rice. Left with fond and loving memories is her son – Harry Rideout (Heather), North Sydney, NS; grandchildren – Jordan and Brandon, John and Michelle; daughter-in-law – Debra Osbourne; brother – Donald Rice (Gilda); sisters-in-law - Millie Rideout and Lucy Rideout. Majors George & Karen Crocker conducted a Funeral Service for family and close friends from Foster Funeral Home, 22 Main Street, Baie Verte, NL on Friday, March 22nd, 2018. As an expression of sympathy, flowers are gratefully accepted, or donations may be made in Eleanor's memory to First United Church Cemetery, Woodstock, NL. Funeral Arrangements have been entrusted to Foster Funeral Home, 22 Main Street, Baie Verte, NL. "A Source of Peace in the Midst of the Storm"